REduce. REuse. UPcycle: the upcycling trend appears to have finally gathered momentum within the interior design field and is defined as taking waste materials (such as old furniture) and converting them into a significantly higher quality product and therefore function (this is where it differs from Recycling). This creative and innovative process promotes the use of more unique, statement pieces within interior design (which in itself is becoming increasingly desirable). But most importantly, it illustrates and encourages responsible design ethics by acknowledging the wider environmental issue of waste and the reuse and reinvention of materials. This in turn also heightens public/consumer awareness of the ever increasing subject of sustainability. It’s for these reasons that I chose this current interior design trend for my board. The images I have chosen represent the diverse range of products that have been created from the old, discarded and (apparently) useless waste materials that surround us today. These items of furniture, lighting, flooring, wallcoverings and decorative accessories whilst practical can also be considered pieces of ‘art’ in their own right. The results produced are a testament to the vision and creative ability of their respective designers and has highlighted that good, functional design does not have to include solely ‘virgin’ material. Image 1 is a simple illustration of how, at its most basic level, combining remnants/scraps of material can be utilised to create an impressive and unique headboard. I literally fell in love with the quirky decorative accessories that are pictured in image 2 – who would have thought that a repurposed tree trunk could be adapted in such a clever and simplistic fashion! Tracy Melton (Focuslineart) is the artist behind these creations, which grouped together on a wall would undoubtedly demand attention within any space. Considering the use of natural, humble materials in interior design is a current trend – these rustic eye catching pieces of art are very ‘current’ indeed. The reused sofa in image 3 is probably my favourite item. It clearly demonstrates what can be achieved with creative vision, whilst ensuring that reuse/reinvention remains high on the agenda. Design By Leftovers is a Swedish team of designers that have produced an entire range of upcycled furniture. Their ethos being ‘pre-loved can be re-loved’. The pictured ‘Charlotte’ sofa has been re-upholstered using reclaimed garments and fabric. This is truly an amazing piece of statement furniture because of its unique design and the story behind its creation. Every home should have one! The innovation in the design of upcycled items is demonstrated in the lighting arrangement (image 4). This is a cleverly designed and constructed light that makes use of plastic bottles and bottle caps. 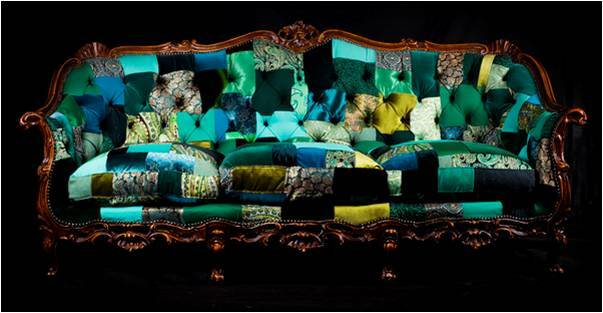 It is the creation of British designer Lucy Norman, who exhibited at Grand Designs Live London 2011. Not only does it reuse this waste product but it also encourages the consumer to reuse as the light is sold with a number of bottle caps missing – an excellent idea. Image 5 is wallpaper that has been made from shredded newspaper. This is produced by a New York based company called Weitzner Limited, yet another example of how the upcycling trend within interior design utilises everyday waste materials and converts them into amazing statement pieces. This wallcovering would make instant visual impact within any space but especially within the commercial/business sector. It’s just as important (if not more) that businesses are seen to acknowledge current environmental issues and if they embraced the upcycling trend within their interior design it would demonstrate their awareness of the importance of reducing and reusing waste but would also help to heighten awareness with consumers/customers alike. 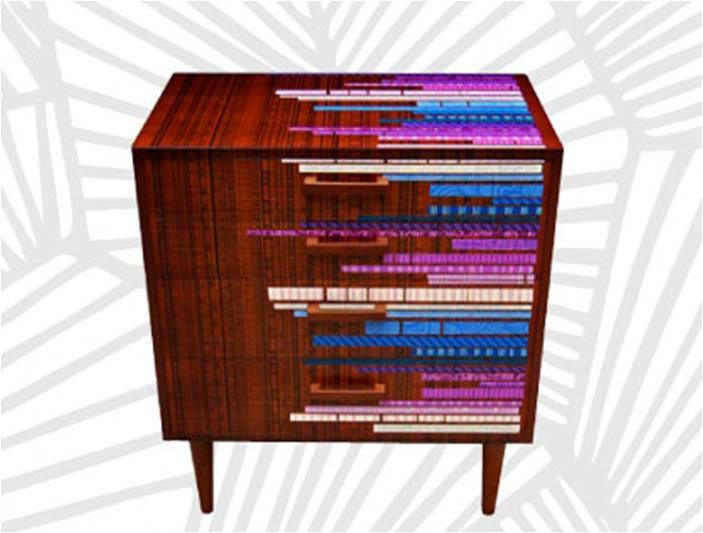 The funky design of the reused mid-century chest of drawers in image 6 is the work of up-and-coming British designer Zoe Murphy. She has teamed up with Osborne and Little to create an upcycled furniture range. It’s always exciting to see high-end design houses buying into emerging trends and it’s clear that the upcycling trend is definitely becoming a greater influence within the interior design field. Pictured above is one of the striking items of reused furniture designed by Zoe Murphy for Osborne and Little. Her creations prove that design can still be fun and quirky even when adopting the upcycling trend. Image 7 depicts wall art that was constructed using steel/stainless steel waste material. This is the creation of Piet Hein Eek, a Dutch designer renowned for embracing the upcycling ethos. His range of upcycled items includes lighting, furniture and various accessories. This piece of art is ‘original’ particularly because of the raw material used and wouldn’t look out of place in today’s contemporary interiors, either domestic or commercial. The seating arrangement formed from an old suitcase (image 8) is most definitely a charming and innovative feast for the eyes. Its uniqueness is one of the reasons why upcycling has become an increasing trend within interior design (as opposed to focusing on just mainstream offerings). This statement piece is the work of designer Katie Thompson based in Cape Town, South Africa. The wooden flooring in image 9 integrates used Whiskey barrels in its construction and is the work of Glasgow based company McKay Flooring. This is a very novel take on upcycling and is another illustration of how waste material can be effectively incorporated into today’s interiors – this type of flooring would look fantastic in a bar/restaurant. My last image (10) is the work of Rupert Branchard – a designer based in London who makes a range of upcycled furniture from salvaged finds. The sideboard has been created using vintage enamelled advertising signs. In his website, Rupert has disclosed how he uses reclaimed school laboratory teak worktops to complete these pieces of furniture. This particular piece blurs the line between interior design and art – but either way clearly demonstrates the individual and original stamp that upcycled furnishings can provide (with great effect) within interior design.